By: Rainbow Rowell lives in Omaha, Nebraska. 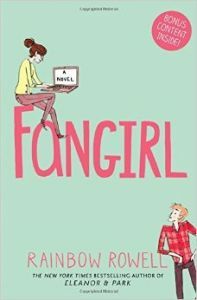 FANGIRL is her second YA novel - the first, ELEANOR & PARK, spent six weeks on the New York Times bestseller list. Fangirl Fangirl is one of Rainbow Rowell's masterpieces. It revolves around two identical twins Cath and Wren who had been together all their lives until 'University life' happened after which both of them went their separate ways. Wren being the more confident one felt that it is time to let loose have a blast meet boys and enjoy life while Cath could not be more different from Wren. She had always been busy with her fan fiction. Now she has to come out of her comfort zone meet new friends make friends with her roommate and explore the true meaning of love. It is a romantic tale of letting your heart be free for once. Rowell traipses the characters into our lives in a subtle manner making room for imagination to take over completely. The characters in the book are vivid and the context drives them to do the wildest of things slowly treading towards an interesting climax. The book also brings to light the relationship amongst siblings their love and their rivalry. While squabbles happen consistently there is also a sense of support that we rely on something which only our family can provide. A certain sense of camaraderie is carried throughout the book making it a peaceful read. Suitable for children and adults across multiple age groups this book is a comfortable and soft story in its entirety. Cath's love for her father manifesting itself in her love for her boyfriend the constant emotional and mental tussles her fight and her emergence is what this story is all about. In a nutshell this book stands for upheavals and courage. The sudden twists in the plot keep the readers glued till the end of the book. About the Author Rainbow Rowell is a critically acclaimed American writer who began her career as a columnist and copywriter for Omaha-World Herald. She rose to fame in 2013 with her novels 'Eleanor & Park' and 'Fangirl' both of which were awarded the title of 'The Best Young Adult Ficton of the Year' by The New York Times. Some of her other novels include 'Landline' and 'Carry On' the latter of which was published on 6th October 2015. You can bag this book from Amazon.in today by following a few easy steps.